We’d love your help. Let us know what’s wrong with this preview of Be Who You Are by Jennifer Carr. To ask other readers questions about Be Who You Are, please sign up. Be Who You Are by Jennifer Carr portrays a controversial theme because this children’s book reflects on a nontraditional feeling a young child may experience. The main character Nick feels as if he was meant to be a girl. He looks in the mirror and hates that he is a guy. As Nick overcomes this issue his family reminds him that he is always be loved and they are so proud of him. The overall theme of Be Who You Are is for all young readers to understand that these feeling of being confused or fee Be Who You Are by Jennifer Carr portrays a controversial theme because this children’s book reflects on a nontraditional feeling a young child may experience. The main character Nick feels as if he was meant to be a girl. He looks in the mirror and hates that he is a guy. As Nick overcomes this issue his family reminds him that he is always be loved and they are so proud of him. The overall theme of Be Who You Are is for all young readers to understand that these feeling of being confused or feeling conflicted with your sexuality is natural. As Nick demonstrates these feelings throughout the book the reader is able to grasp a well understanding that he feels discomfort and through the support his family has provided him, he is able to be who he wants to be. 'Be Who You Are' is the first in a series of children's books designed to educate children, siblings, parents, family, friends' caregivers, educators and the community about gender non-conforming kids. I thought it was simple and nice - simple wins to be honest. It didn't go into every intricate detail, but it's a kids book so it has to be necessarily simplified. It suited the audience and was easy to use. Be Who You Are is a children's picture book written by Jennifer Carr and illustrated by Ben Rumback which focus on a transgender girl named Nick and her journey into becoming her true self as Hope. This book maps out the ups and downs of her journey and in the end – the journey never really ends, but at least Hope is herself and most importantly happy. Carr's text is simplistic and flowed rather well. It was really poignant – the reader could feel the frustration and confusion with Nick's gender Be Who You Are is a children's picture book written by Jennifer Carr and illustrated by Ben Rumback which focus on a transgender girl named Nick and her journey into becoming her true self as Hope. This book maps out the ups and downs of her journey and in the end – the journey never really ends, but at least Hope is herself and most importantly happy. Carr's text is simplistic and flowed rather well. It was really poignant – the reader could feel the frustration and confusion with Nick's gender identity, the love of her family, the sadness that not everyone would understand her, and every other emotion under the sky. Rumback's art is simply wonderful filled with big and colorful illustrations and compliments the text really well. The premise of the story is straightforward one of a transgender girl transitioning. However, the path to the destination is anything but straightforward, there are many twist and turns, and road stop along the way – something one wouldn't expect in a children's picture book. Yet through all her trails and tribulations, detours and pit stops, two things remains abundantly clear, her parents unconditional love for her and their message to be who she is. "Each day brings the chance for all of us to be who we are, to accept others for who they are and to make the world a more loving place for everyone." I'm always one of those people who needs to learn more about a subject. To be supportive, an advocate, and someone somebody can come to to talk. Be side by side with people to fight for your rights. This book is a great tool for kids who have questions. This shows them that we aren't all the same and if someone is different then we accept them an "Each day brings the chance for all of us to be who we are, to accept others for who they are and to make the world a more loving place for everyone." When Nick looked into the mirror, his brain told him he was a girl. He was a boy, but wanted to be a girl. He liked girl clothes, and tried to do thins like them. In school, he wanted to go into the girls bathroom, but got in trouble. His parents knew what he wanted and were okay with it, and went and told his teachers and everyone else in the school what he wanted. They always told Nick, "Be who you are." I love this book! I am so thankfully to have trans resources like this available. I love how this book follows the main character as she explains how she is feeling to more and more people around her and people start to understand and accept her better. A bit wordy for a 5 year old, but the book is wonderful other than that. Main character in story is mtf. 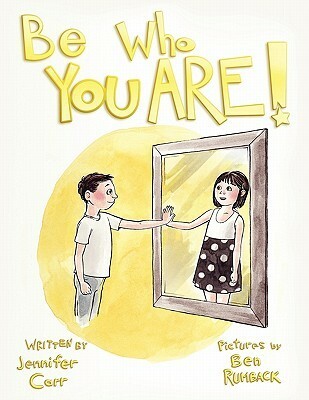 Be Who You Are, published by Bloomington's Author House, is a picture book depicting the life of a transgender girl. This book is an excellent way to introduce or explain the concept of transgenderism to young children, and also a great resource to remind transgender children that they are accepted and loved. I like this story because his(her) parents support her and are understanding of how she feels. They don't tell her that it i wrong to eel that way, but they accept the way he(she) chooses to dress and let him(her) grow out his(her) hair. I like that the parents love and accept their child for who he(she) is ans wants to be. Be Who You Are is the story of Hope....a transgender girl. This is a great book (based on a true story) for anyone really...it is so much more than being transgender...it's about being true to yourself, the love and support of your family and acceptance....something everyone can learn from. A very affirming book. It is simple and designed for younger children experiencing this themselves or to learn about this and understand others. It was a little over the 3 year old's head, but a good resource to have on hand, I think. Good book about a young trans girl. Great lesson for all children, all people really in this book. I would recommend this to any teacher in any setting. This would be an excellent book for a bullying presentation.